The Year of Living Fabulously: Glee, Emma Pillsbury or Oprah Fans-Red Alert!!!! Glee, Emma Pillsbury or Oprah Fans-Red Alert!!!! Wednesday April 7th is a special Glee Episode on Oprah. The Advanced Mixed Show Choir from my daughter's school is performing as an example of a real Show Choir. Please watch. It should be fantastic. I'm so excited. My daughter is a freshman and in the beginning show choir at Burroughs High School in Burbank. They filmed the choir room scenes for Glee in her school's choir room. I guess that's why they chose us. That and because the choir is amazing. I am also a fan of Emma Pillsbury's style by the way. I don't know if she's on the Oprah episode but a lot of the cast will be there. Thank you, Oprah, but no picture of you. More Emma. How fantastic for your daughter. What an experience. 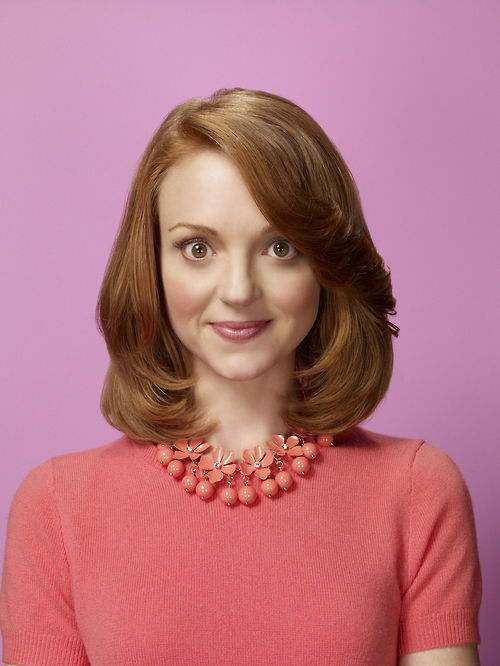 I love Emma Pillsbury, she is so gosh darn cute!! Congrats for your daughter too! Thank you thank you thank you! Just to be clear my daughter didn't perform. She's in the beginning choir. This is the advanced choir of Juniors and Seniors. Apparently Oprah gave the choir an amazing gift of some sort but they had to sign a secrecy pact (I like to imagine it involved spitting and handshakes) so we won't know what it is until the show airs. Whee!